Learn the basis behind and method for designing Kanban workflow systems. As a KMP I participant, you’ll receive a free digital copy of the book Kanban: Successful Evolutionary Change for Your Technology Business by David J. Anderson, who is credited with the first implementation of a kanban process for software development, in 2005. 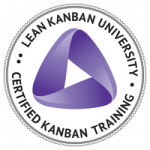 Upon successful completion of your KMP I class, you’ll receive a digital Certificate of Completion from Lean Kanban University, ready to forward to current or future employers. You’ll also receive a lifetime membership to Lean Kanban University and a listing in the LKU Alumni Directory. As a course participant, you’ll receive free lifetime access* to the agile planning and implementation tool Get To Done® (a value of $60 per year). *Access expires if account remains inactive for 12 consecutive months. Even with heightened engagement, most of us only retain a fraction of what we learn. That’s why you’ll have the option to retake our class, so if you want to refresh your knowledge, you can do so within six months at no cost. More details at can be found in our policies. This KMP II course is not your usual classroom training. Instructor Marcelo Lopez, Jr. uses cutting edge adult learning practices, which not only make the class enjoyable, but are proven to increase retention and understanding. The Kanban Systems Design course is a 2-day overview of the Kanban method. Evidence-based information will provide an approach to introducing the method into your organization. Learn the efficacy and effectiveness of Kanban through group exercises, discussion and highly interactive game play.